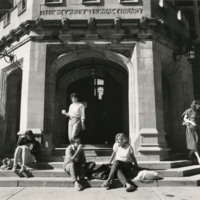 Five unidentified students are pictured outside of the entrance to the M. Carey Thomas Library. 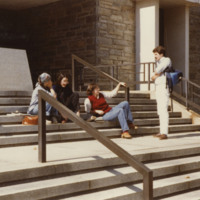 Three are sitting on the steps while two are standing or walking. Four unidentified students are pictured. 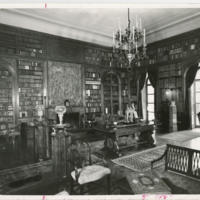 Three of them, all female, are sitting on the top steps of the library (one holding onto the railing) while a male student stands and looks on.